Comic-cons and other comic-related conventions can make a LOT of money! Fact is, there’s a convention with comics creators being held nearly every weekend each year now. The rub is, both creators and fans have to travel in order to make a convention happen. I’ve travelled hundreds of miles to attend the San Diego Comic-Con. Writers, artists and other creators go all over the U.S. and even to other countries to interact with fans. Oh, and sometimes they even make money! However, things are always changing, and this past Saturday, I attended a convention unlike any other I’ve been to. Was the In-Store Convention Kick-Off the future of convention attendance? BOOM! Studios, Dark Horse, DC Comics, IDW Publishing, Image, Marvel and Valiant Entertainment participated in the event. Each publisher had a fifty-minute segment that ran at the top of the hour between noon and 7 p.m. EST. After that, other comics creators such as Cullen Bunn took the spotlight. A number of stores across the country participated in the event including Coliseum of Comics (5 locations) in Orlando, FL; All Things Fun! (2 locations) in West Berlin, NJ; Twilight Comics in Shiloh, IN; The Comic Books Shop (3 locations) in Spokane, WA; Neptune Comics in Waukesha, WI; Dr. No’s Comics and Games in Atlanta, GA; Alter-Ego Comics in Lima, OH, Samurai Comics (3 locations) in Phoenix, AZ; Comix Experience in San Francisco, CA; Comickaze Comics, Books and more! In San Diego, CA; Illusive Comics and Games in Santa Clara, CA; Casablanca Comics (2 locations) in Portland, ME; Third Eye Comics (2 locations) in Annapolis, MD; Graham Crackers Comic Books (9 locations) in Chicago, IL; Main Street Comics in Middletown, NY; Impulse Creations in Tulsa, OK; Hypno Comics in Ventura, CA; and Comic City (4 locations) in Detroit, MI. Guests included: Brian Michael Bendis, Shannon Watters, Dan Didio, Filip Sablik, Jeff Loveness, Jay Faerber, Chris Ryall, Tom Brennan, Gabriel Hardman, the aforementioned Cullen Bunn, Ed Brisson, Randy Stradley, James Tynion IV, Corinna Bechko, Mel Caylo, and Jeff King. There were at least two avenues fans could use to submit questions, including Twitter and texting to a phone number. Instead of flying across the country or driving for hours, I only had to travel to local comics shops for this event. I went to one early in the afternoon, then a second at another franchise location later in the day. Attendance was free. Both stores had sales associated with the event going on, often during that company’s presentation. I’m sure the attendance and experience varied from place to place. 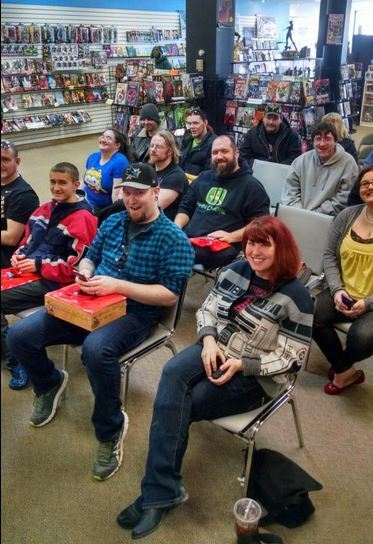 For instance, the photo included with this article came from Alter Ego Comics, and they had a nice turnout for the Valiant Comics presentation, the first in the day. It was somewhat different where I went. We arrived near the end of the Valiant presentation, and there were about four or five folks listening. There was a break before Marvel started, and instead of video for much of their time, they showed slides of upcoming product. We did hear the voices of several creators, who talked about what was coming. The store was doing a brisk business with a good number of customers buying things there, so it was a little tough to hear what the presenters were saying over the two television screens. When I arrived at the second store, I found only one screen located in the gaming area, which had a lot of people playing games, appropriately enough. The bad news was that it again made listening to the DC folks very difficult. I had to stand up near the TV to hear what they were saying. However, that wasn’t a problem since at that point, I was the only one listening to the presentation. Previously, one of the store’s employees was also paying attention. That was all who participated at that point, which happened during the 5 o’clock dinner hour, which may account for the smaller numbers. I use Skype software to record my weekly Wayne’s Comics Podcast, and I know that’s it not always the most dependable method of communication. Sadly, whether this program was used or something else, video and sound proved tough to understand when I listened to the presentations. I’m hoping the others stores involved had better luck, but a lot of the time, the folks speaking had what they were saying turned into sputtering noises and divided sentences. Also, some of the presenters were unable to log on, and when they did, often the sound quality was, in a word, awful. I was reminded of trying to make sense out of Max Headroom a lot of the time. Jeff King arrived very late for the late-starting DC Comics presentation, leaving Dan Didio, Co=Publisher at DC Comics, doing a lot of the talking. Even when he was finally got there, the host had to tell Mr. King that he was difficult to hear, causing him to try and correct the situation while on-air. I did learn some interesting things from Mr. Didio, including the fact that Mr. King, who is scripting the upcoming Convergence comic, came to DC’s attention during a tour of their offices. The part that made me wince took place during Dark Horse’s time at 6 p.m. Randy Stradley, Vice-President of Publishing at the company, was talking with the host who apparently had been guiding discussions, including reading questions sent in by fans, during each hour of the day. In the middle of Mr. Stradley’s talk, the host’s connection was lost, leaving Stradley to fill the time as best he could. He asked if anyone else was there, and when there was no answer, he pulled up a bottle of beer, opened it, wished “Cheers!” to the audience, and guzzled down a brand I’m not familiar with. It only felt like forever before the host returned. Yikes! Also, I noticed that both stores had to reboot their computers at times to re-establish their connection with the main audio and video feed. My podcast is audio-only, so these video events, even if they were using something other than Skype, probably hogged a lot of bandwidth, which is why the machines needed to be restarted. I’ve looked a lot online, and I haven’t found a lot of response regarding this event. Before I left the store, I asked its manager how he thought this event would return, if at all. He said that next year, he would work on making it a much more social gathering instead of just watching a TV hour after hour. They had tested the system before the event was held, and they felt it worked well without many technical problems. He did say it would be back in 2016. My suggestions for future In-Store Conventions would be to have a back-up system in place so people wouldn’t disappear or not be able to log in. I’m hoping the audio difficulties were specific to the stores I was at and that other locations didn’t have that problem or, if they did, not so much. I think that research needs to be done to make sure the sounds of the speakers will not be tough to understand next time. I also think some important announcements should take place during this event. My understanding was that most companies played it safe, with some even saying that their announcements would take place before or at San Diego. We’ll see. I think In-Store Conventions are a good idea. The technology being used needs to be upgraded and worked on to make it more interactive and more understandable. If a store has a customer who wants to ask a question, they could have a camera and microphone set up so they can be seen by the creator. Or even let fans record and send in their video questions. That’s part of the lure of going to a convention – to have some kind of limited interaction with them! Will this kind of event replace comic-cons? I don’t foresee that happening in the near future, but it can be a worthwhile event that will attract more customers and thus help stores sell more product! That will help both the stores and the industry as a whole moving forward!